A month packed full of Christmas Casino promotions at Slotty Vegas! Christmas is one of the best time for slot players with casinos running multiple promotions to celebrate the Christmas period, not to be outdone Slotty Vegas Casino has launched not 1 but 6 different Xmas themed promotions that are running throughout the month of December. Whether you are a fan of Extra Spins, Super Spins, Table Games with Cashback, Casino Bonuses or weekly Reload Bonuses then Slotty has you covered this month. More details of all of these great promotions are listed below, and do not forget to check out our comprehensive Christmas Casino Promotions section too to check out everything else on offer this month! Make multiple deposits at Slotty Vegas on a Monday to earn Extra Spins the following day. The more deposits you make the greater number of Extra Spins awarded. Extra Spins are credited on a Tuesday on a variety of top slots. This offer is only valid between 00:00 CET to 23:59 CET every Monday during December. How many Extra Spins are on offer? Free spins winnings are subject to a 10x wagering requirement. Join Slotty Vegas Casino Now! Wager money on slots and table games during the week to earn rewards at the weekend. Earn 1 point for every €5 wagered on slots and 1 point for every €10 wagered on table games. These wagering promotions run from Monday 00:00 CET until Friday 23:59 CET, Weekly during December. Bonuses are subject to a 20x wagering requirement. Weekly Reload Bonuses when depositing that become available every Monday – the percentage changes each week so check each week. Week 1’s Reload Bonus is a 100% deposit match up to €/£/$100. Minimum deposit of €/£/$20 is required in order to claim the bonuses. These bonuses work almost as a second chance bonus, the wagering requirements only kick in if your balance goes into bonus money, before this you are not tied into any waging requirements for your real money funds. Reload Bonuses are subject to a 40x wagering requirement, real money funds do not contribute, the bonus wagering kicks in if you dip into bonus money funds. Make a deposit any day during the Christmas period to earn a spin of the Wheel of Fortune where you can earn Extra Spins. Promotion runs from Friday 00:00 CET 1 st December to 23:59 Sunday 24th December. 3 Prize Wheels on offer with larger rewards on offer for bigger deposits, claim once per day only. How many Extra Spins can you get? There are 3 different prize wheel on offer based on the largest deposit amount on any given day, the rewards on offer are listed below. Deposit between €20 and €50 – Wheel 1 – Up to 100 Extra Spins on Flowers Christmas Edition, Fruit Shop Christmas Edition, Jungle Spirit, Secrets of Christmas, Starburst Twin Spin. 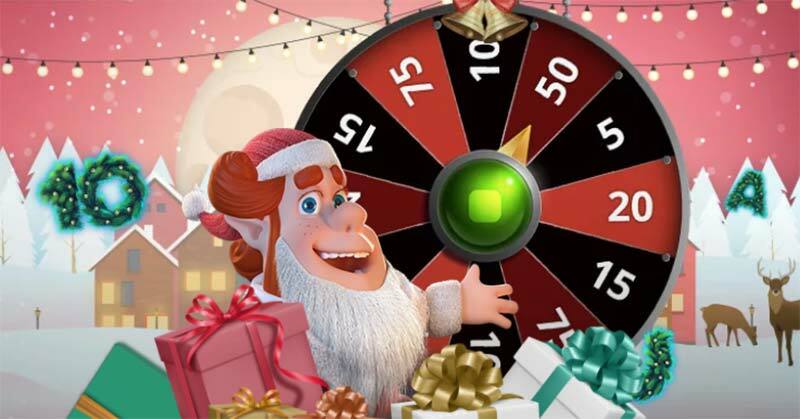 Deposit between €51 and €200 – Wheel 2 – Up to 50 Super Spins on Flowers Christmas Edition, Fruit Shop Christmas Edition, Jungle Spirit, Secrets of Christmas, Starburst Twin Spin. Deposit between €201 or over – Wheel 3 – Up to 100 Super Spins on Flowers Christmas Edition, Fruit Shop Christmas Edition, Jungle Spirit, Secrets of Christmas, Starburst Twin Spin. Play Roulette of Blackjack on a Thursday during December at Slotty Vegas to earn 25% cashback on losses, credited the following day. Promotion runs every Thursdays 00:00CET to 23:59CET during December 2017. The minimum amount of cash back to be credited is £/$/€15 and the maximum is £/$/1,000. This offer is only applicable for standard and live variants of Blackjack and Roulette. The cashback credited will have a 30x wagering requirement. The promo codes will be available every Sunday through the month to claim Extra Spins when depositing. Bigger deposits are able to claim more Extra Spins. A deposit of at least £/€25 is required in order to claim the Extra Spins. Promo Codes are only valid between 00:00 CET to 23:59 CET every Sunday. Deposit £/$/€ 25 or more – Bonus Code – SWEET50 – 50 Extra Spins on Elements, Glow or Neon Stax slots. Deposit £/$/€ 50 or more – Bonus Code – SWEET100 – 100 Extra Spins on Elements, Glow or Neon Stax slots. Deposit £/$/€ 100 or more – Bonus Code – SWEET30SS – 30 Super Spins (High Value) on Magic Portals, Copy Cats or Scruffy Duck slots.